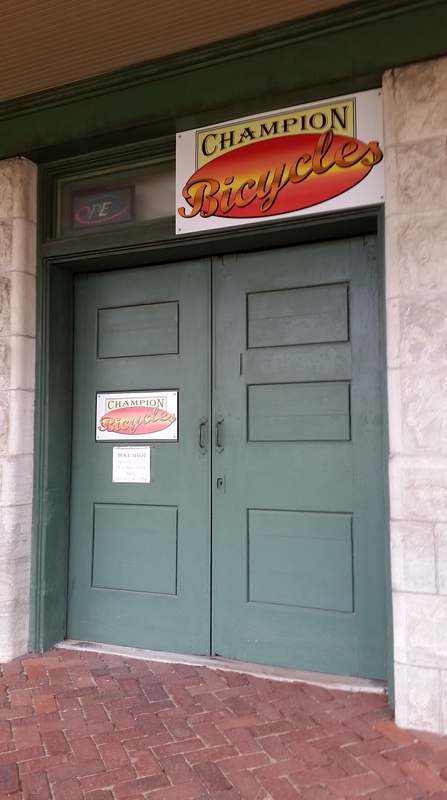 Champion Bicycles is located in the Katy Depot in Sedalia, Missouri on the Katy Trail. The bicycle shop offers rentals, repair and service on all makes and brands, a full line of parts and accessories. Also, drinks and snacks are available. Katy Trail State Park. New bicycles for purchase include Fuji, Schwinn, and GT. You will also find bikes here from the 1960s up to the 2000s such as mountain, hybrid, road, touring and cruiser rides. Brands such as Raleigh, Trek, Specialized, Diamondback, and Schwinn are featured. All repairs are a key element to the business since the Katy Trail is ten feet from the door. Quick turnaround on flat tires and adjustments get our customers back on the road. Stop in and meet Steve Champion.